Explore the abundance of diverse activities and events around the North Lake Tahoe area - just steps outside of your room at the Tahoe Vistana Inn! View the Vistana Information Guide that we have created below to help plan your stay, with local insider information! We are located in Tahoe Vista (#3 on the map), with Tahoe City (#4) and Incline Village (#1) each about a 15-minute drive from our location. *Use the slides below the map to see where restaurants, outdoor/indoor activities and hiking locations are in relation to us. The divider down the middle of the lake in the image below is the state line between California and Nevada (3 miles from us). 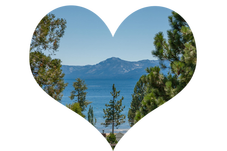 ​Click here to view the "Go Tahoe North" website with more information for local activities! ​Check out what is going on this week, free activities on the North Shore, hiking, mountain biking, golf and much more!